So proud to kayak for this champ. 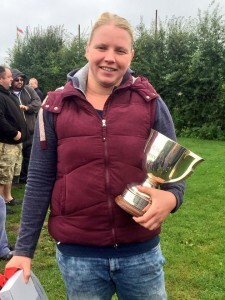 Eastern Bay SC, Leinster Open Sea Swimmer, Sabrina Wiedmer, just completed a 35k race to swim the length of Loch Lomond….she won too! We set out as the sun was setting with the loch stretching out, long and narrow, ahead of us. 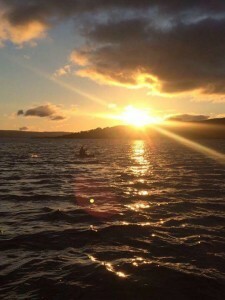 I hadn’t told Sabrina, but I’d had an encounter with a borrowed kayak a few days earlier, which saw me falling out in just 3 inches of water, wearing full battle gear; wetsuit, buoyancy aid and helmet. I was dreading making an eejit of myself again and took my chance when no one was looking to launch unassisted into the loch. 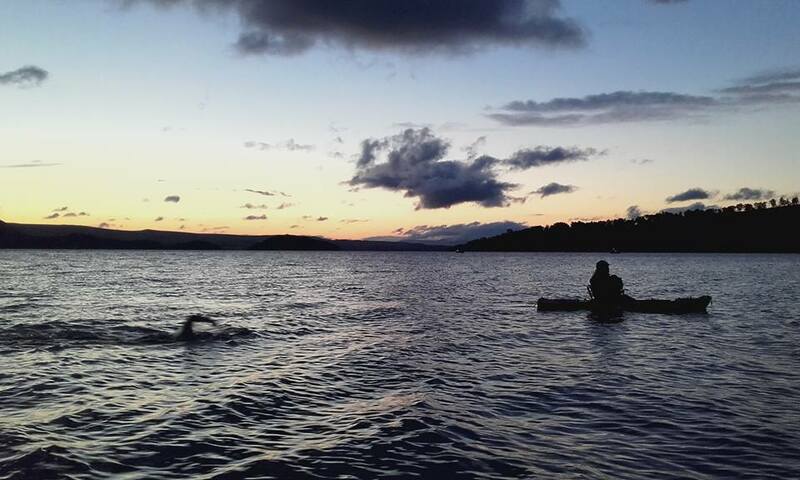 Without a splash or a blush, I safely got my self comfy and waited for the countdown that saw my swimmer take to the water and push off into the night. Settling down, I paddled fairly silently beside her, resigned to the knowledge that we had 10 or 11 hours of work ahead. Those who know swimming and swimmers can identify and appreciate the strength and fluidity of a swimmer like Sabrina, but for those who are not, just let me say – she’s impressive. We had a super crew with Colleen Mallon and Alex Engel on the powerboat manned by Stewart Griffiths and Chris Sifleet of Swim4Miles. Along with safety and guidance, there was plenty of laughter and encouragement. ‘Breaks’ for feeds took only seconds, but they were welcome distractions, as the dark closed down around us. At one point we realised that our ‘lighting’ job on the kayak hadn’t been sufficient and Sabrina suggested a re-positioning of an LED torch that was flashing away merrily on my shoulder. I unclasped it and set about positioning it lower down on the boat when the next second the feed ended and Sabrina was off. With a moment of baffled horror I looked at the torch in my hands and considered abandoning it to grab the paddle. I hesitated, realising that I’d regret losing the light in the total pitch darkness that had now descended. Yet I could hear the splash and fall of Sabrina swimming off into the lake. “Follow my swimmer” I yelled to the boat in panic, before sticking the lamp in my gob and tearing off after them into the night. The next feed offered me a chance to readjust myself properly and with the kayak now lit up like a Christmas tree, we continued on our way. It was a very long way. There were no tides, but there were plenty of currents, islands to navigate, and hours and hours of progress to make. Finally, we cleared the islands and with dawn breaking made our way into a large expanse of water known as ‘The Basin’. As the light strengthened we could see the finish line ahead, so close we could almost reach out and touch it. But as we crossed away from the shelter of the narrow pass, the wind picked up and started pushing us back across the lake. Over an hour passed where we just had to keep pushing against the rolling, choppy waves, inching our way closer to the prize. It’s a bit of a life lesson but there is absolutely no alternative in a situation like that but put your head down and push on, grinding up the inches and the minutes and slowly moving forward. I knew without any doubt that Sabrina would not stop at this stage, not if every fibre in her was screaming, which it probably was. That girl is stubborn, in the very best way that a girl can be stubborn. The final push to the shore was almost an anti-climax. In bright daylight, with a heartening crowd who were noisily welcoming our final approach, we were just glad to finish. It will probably take a while for me to realise and appreciate what I have just been a part of. I wonder does Sabrina realise how truly amazing she is? This was Sabrina’s challenge, and Sabrina’s fine Scottish adventure. But I can’t help being a little bit pleased with myself too. I am absolutely chuffed to have been able to keep up with the human torpedo that is Sabrina Wiedmer and I’m very grateful to her for the opportunity. I kayaked 35 kilometres, the whole length of Loch Lomond, a lake I only ever read about before in books. That’s quite an achievement for a lass who always wanted to kayak but thought she was too fat to fit in a boat. I am somewhat in shock. I have just got my #LiffeySwim times. This is my 3rd time to qualify for, and take part in, the #LiffeySwim; which had long been a secret ambition of mine, when I reported on the race every year as a journalist with 98FM. The organisers use a race-handicap system, putting the slowest swimmers in the water first. In 2014 I had hat number ONE. 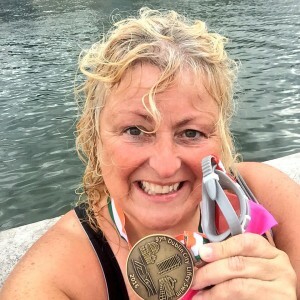 I was the first person into the river and the last person out – taking 1hr-28mins to complete the 2.2k swim from the Guinness Gates to the Custom House. The following year (last year) I had hat number 3 and was the 3rd-last person out of the river. I just want to say this is pure proof that you can improve on your ability and fitness no matter WHERE you start your journey from. I’m sooo emotional just right now. 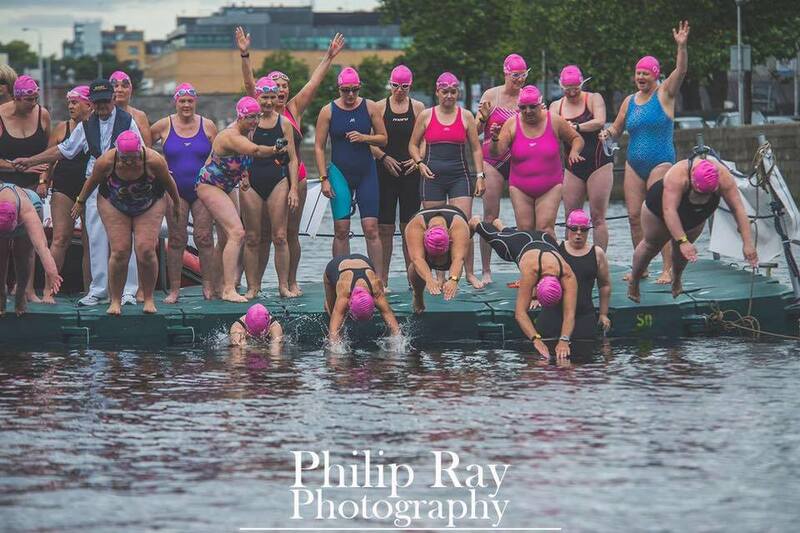 This is a dream come true for the lass who a) never thought she could swim the Liffey, and b) became the lass who swam the Liffey so slowly that everyone else had finished and was hanging over the river wall shouting encouragement as I splashed my way up to the Custom House steps. Thank you to all my fellow swimmers who are constantly reassuring me, my club Eastern Bay who do the best Sunday swims ever, my adopted club NAC Masters who never complain when I clog up the swimming lanes at their Thursday night swim sessions. Our 8th triathlon brought us to Wicklow for the King of Greystones charity tri for the Gavin Glynn Foundation. I probably struggled the most on this one. I woke up with a dodgy tummy and can think of half a dozen places I would have preferred to be. But I managed to get to the finish line all the same. Not without an embarrassing amount of whining though. The stones hurt my feet on the way down the beach to the start of the swim and I actually wanted to cry! If it wasn’t for our team physio Mike Wearing, administering a bit of coaxing and bundles of positivity, I don’t think I would have made it. I didn’t do a bad swim, didn’t do a bad cycle, but when it came to the 5k run, I was just all shot… and I walked and trotted my way home. It’s the first time I have actually come last in a race but perhaps that’s good for the soul occasionally. Determined to work harder for the next one.